OnCrawl is a data-driven website crawler and log file analyser that can deliver a daily ‘health check’ of your onsite SEO status. 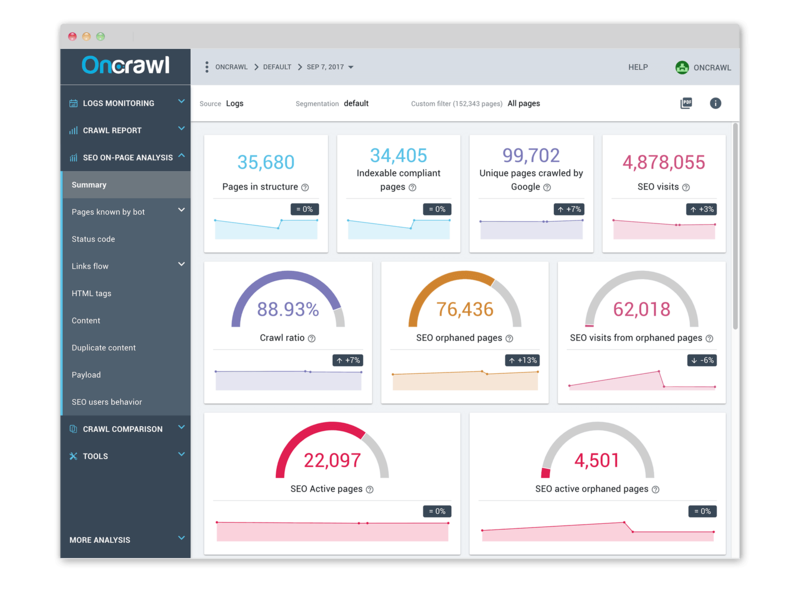 OnCrawl provides detailed SEO data and analysis on a daily basis for optimal SEO performance – and is suitable for all types of websites, whether you work in-house or in an agency. OnCrawl’s easy to use SEO crawler monitors the indexability of your content on a daily basis. 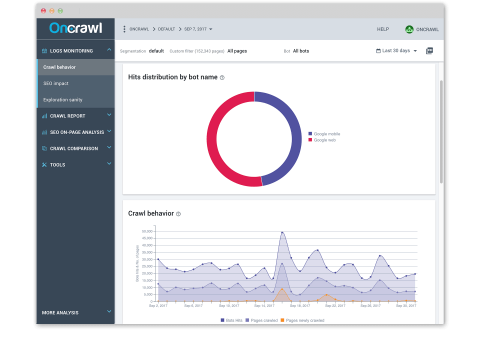 You can use the insights provided by the crawler to improve the quality of your content – analysing for uniqueness and richness as well as highlighting duplicate content. 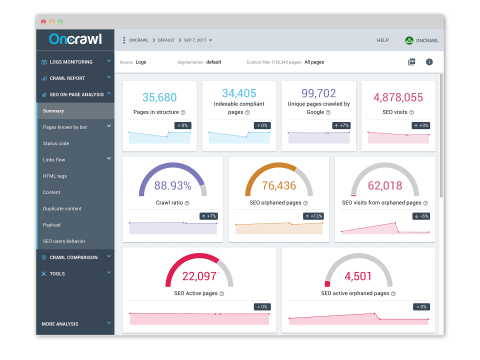 The crawler also provides information on page load speed across your site, helping you deliver the best user experience. You can also track your internal linking structure and the click depth of your most important content, making sure your money pages are high up in the site architecture. By analysing your log files you can gain an understanding on how Google, and other bots, interact with your website. 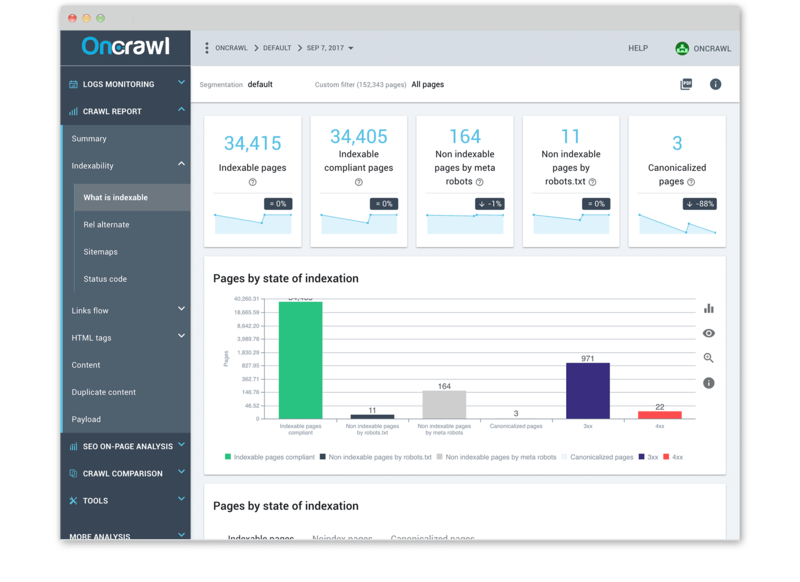 Discover the crawl frequency of each of your pages and review the inactive URLs that may need attention. As OnCrawl crawls and analyses your site on a daily basis, the Log Analyser can let you know what status codes are being returned to bots each day – so you can see where the 404 ‘dead ends’ are and if there are any server issues e.g. 500 errors. The SEO Impact Report combines the crawl and log files to give you a clear overview of your page structure – identifying exactly what Google is crawling and how often. This allows you to detect ‘orphan pages’ and see the impact of crawl frequency on SEO visits. How much does OnCrawl cost? With the Pro package you can crawl 100,000 URLs each month on one website – so is designed for bloggers and webmasters who run just one website. The Business package lets you crawl 500,000 URLs across 10 websites – perfect for small agencies or in-house SEOs running several internal domains. The Ultimate package comes with the capacity to crawl 2,000,000 URLs per month across 50 websites. If you want a high level of access to the tool for big data projects, then the Premium package will crawl 10,000,000 URLs per month across 100 projects.